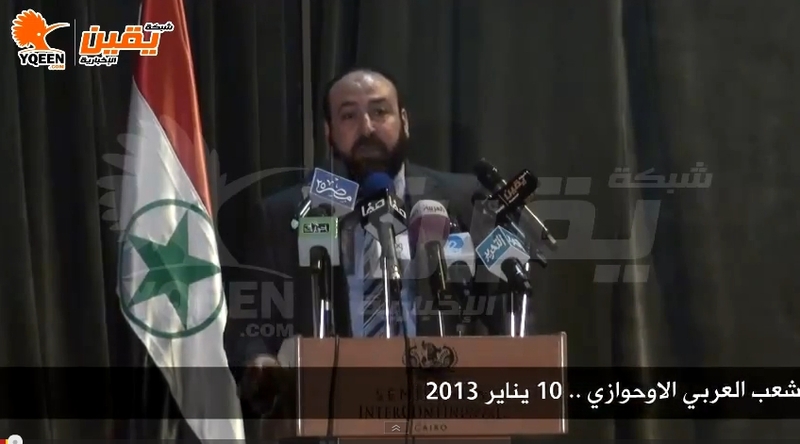 Iranian hardliners have reacted with fury to a major conference in Cairo rallying support for the Ahwazi Arab cause. Held on 10 January and coinciding with a visit to Egypt by Iranian Foreign Minister Ali Akbar Salehi, the conference was organised by Egyptian Salafists and Ahwazi activists and denounced "Persian occupation of Arab lands", receiving wide coverage in the Arabic media. Among the speakers was Emad Abdel Ghaffour, the founder of newly founded Egypt's Al-Watan party and former leader of the Al-Nour party. Ghaffour also holds the position of the President's assistant for community outreach. Speakers also included Saudi preacher Mohammed al-Arifi, members of the Al-Azhar Mosque, the World Islamic Coordinating Council, the Ahwazi Justice movement, the Forum of Muslim Scholars, and the International Humanitarian Institutions Union, in addition to the Egyptian Reform Party and the Building and Development Party, the political arm of the Gamaa Islamiya, according to Al-Monitor. Representing Ahwazi Arabs was Sabah Mosawi of the Ahwazi Arab Renaissance Party (AARP). Ghafour called for the conference "to be the launching pad for supporting the cause of the Arab people in every neighboring Arab country against the Persian occupation." He added: "We raise our voices not only in the names of Arabs but also in the names of Sunni Kurds and Ahwaz people who have been subjected to great injustice. While some countries raise the banners of justice, we seek more than that. We want to show our support for the oppressed." There was angry reaction to the meeting from within the Iranian establishment with calls for Iran's President Ahmadinejad to cancel a meeting with Egypt's President Muhamad Morsi in protest at the conference. There were also unfounded accusations of Qatari sponsorship of the conference and claims that it was arranged by the pro-Ahwazi lobbying group the British Ahwazi Friendship Society (BAFS). BAFS Chairman Daniel Brett said: "The conference had no BAFS involvement and our focus is solely on activism in the UK and Europe. It appears to be an initiative by a grassroots convergence of Arabs who have grown weary of aggressive Iranian interference in the Arab world and desperate Ahwazis who have experienced over 80 years of persecution and marginalisation, without a word of support from their Persian compatriots. "No doubt Ahwazis will welcome solidarity with their struggle from wherever it comes. But the Persian opposition has not only failed but has been a cheerleader for the racial persecution of Ahwazi Arabs and some supporters of the Pahlavi dynasty have praised the execution of Arab activists. As a spurned and hated people in Iran, Ahwazis are turning to the revolutionary leaders of the Arab Spring movement who support their right to self-determination. "It is good to hear the Arab world taking more interest in the Ahwazi struggle and Mr Ghaffour and others should be praised for their stand against Persian chauvinism. Since Ahwazi Arabs are indigenous to an oil-rich region exploited by Tehran to maintain its terrorist state, the solidarity with the struggle will have significant massive implications that will be of benefit to all, apart from the ayatollahs and their allies and puppets. Al-Ahwaz is on the brink of becoming the new front-line in a new Arab Spring." On 11 January, Ahwaz City witnessed the destruction of Iranian administrative buildings in a massive explosion, for which the Ahwaz Islamic Sunni Organisation (AISO) claimed responsibility; there were no casualties. The explosion came after statements of solidarity by the Free Syrian Army, which has created an Al-Ahwaz battalion. 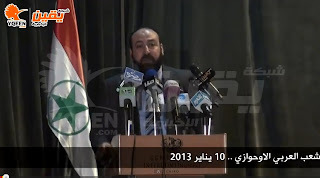 Meanwhile the Arab Struggle Movement for the Liberation of Al-Ahwaz (ASMLA) has held top-level talks with the Syrian Muslim Brotherhood, which has expressed its support for the cause of Ahwazi Arab self-determination.